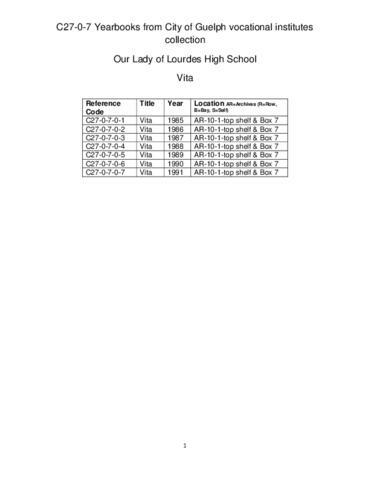 Series consists of the yearbook "Vita" produced annually by Our Lady of Lourdes High School. The yearbooks are arranged chronologically by year, however, there are gaps in the years covered. Please consult the file listing for more details. Copyright for these records is not held by the Guelph Public Library. Please contact the Guelph Public Library archivist about how to obtain the necessary copyright permissions. To access records in this series consult the file listing C27-0-7 to narrow down your search. Order the desired boxes from the Guelph Public Library Archivist.